PDF Bundler is an add-in within MatterSphere. It allows you to select multiple documents from your MatterSphere documents and create a single bundle for them. It will also generate an index within the bundle if you wish and paginate. 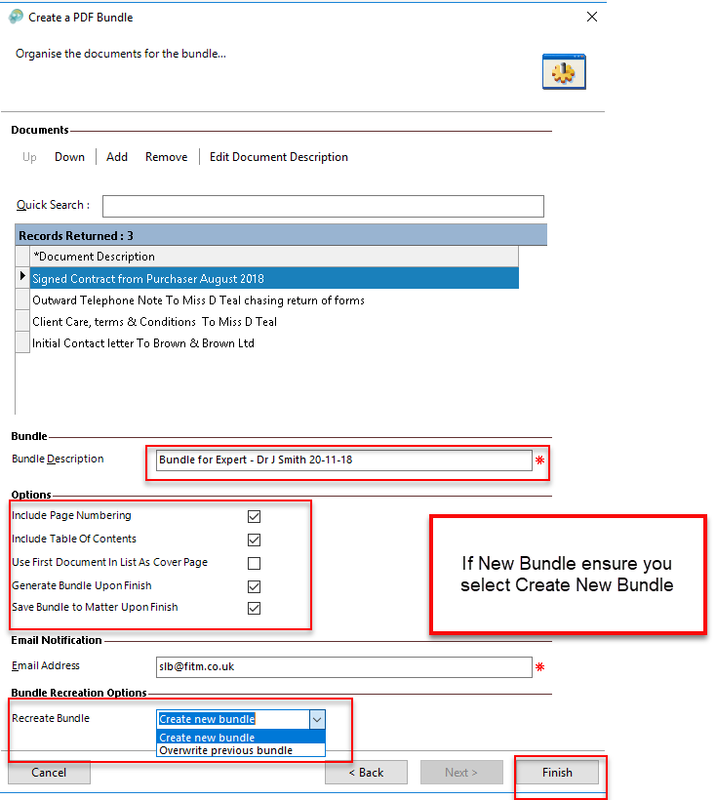 There is the ability to email the bundle and also save it directly to your documents providing a record of what is in the bundle. Extra features allow you to add to and remove from the existing bundle to generate a new one. This means updated bundles do not have to be re-created from scratch every time. Select the documents you require by holding your Ctrl key on your keyboard and clicking on the grey box next to the document you wish to add. In this section you have optional tasks. Use as necessary. Click Add – this will display all the documents on the matter and allow you to select ones not already added. It is mandatory to add a Bundle Description. Options are a series of tick boxes to include and generate specific items. Some of these will be ticked by default. Always check and ensure the correct options are selected. 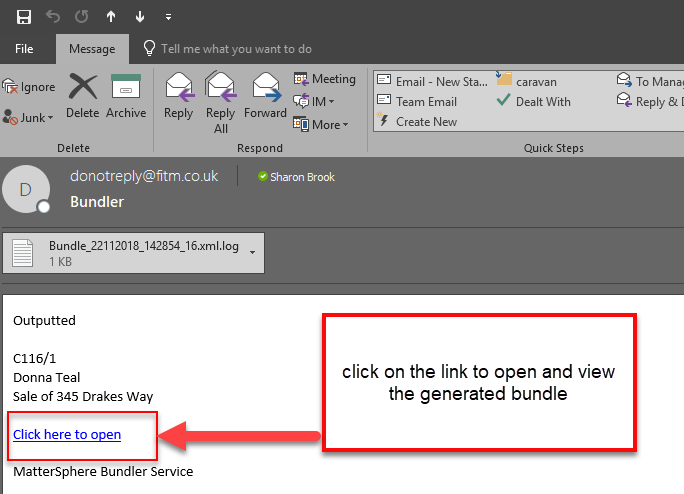 An email will be sent as specified from which the bundle can be viewed. This could be sent on as it is but this does not display the bundle name. The bundle is displayed in PDF format. 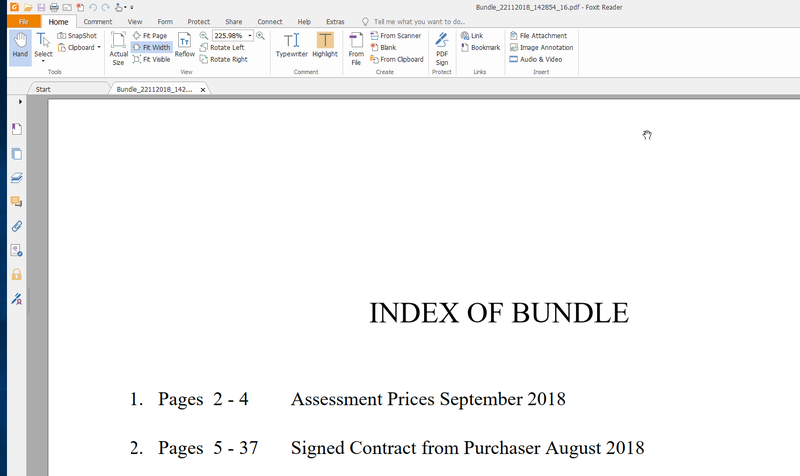 The bundle is also visible in the Matter documents as a PDF document (only if this option was selected). This can now be sent as an attachment. 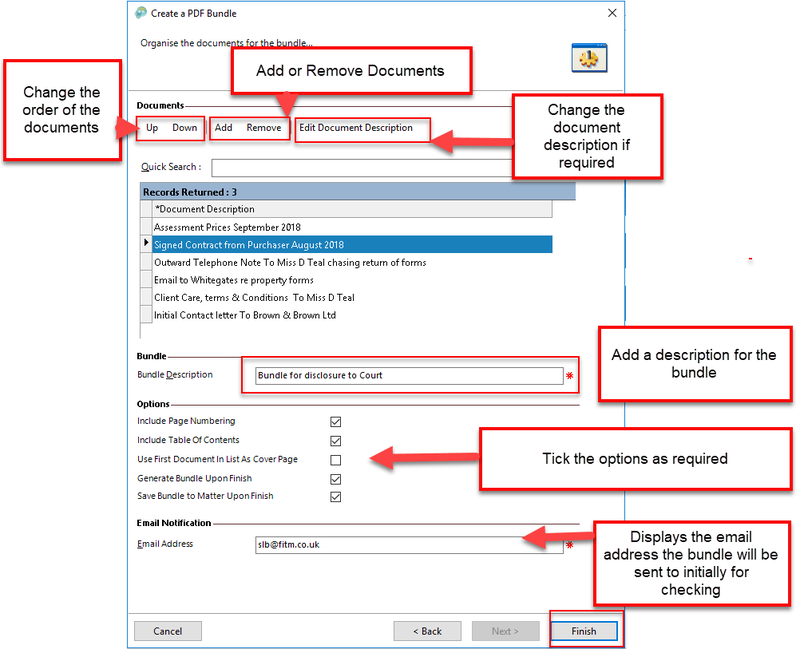 Should you need to add to or remove items from this bundle or use a previous one to generate a new one this can be done from the Previous PDF Bundle option in your Matter Documents. From the next screen we can now Add, Remove or change order of documents. If you do not have PDF Bundler installed as part of your MatterSphere package and would like to know how to access this please do not hesitate to contact us.